At present Google Chrome is the best browser for Windows operating system in the market. As it's the one of the top and best browser so it is required that it should be free from all the bugs and errors. Developers try their to remove any type of bug in Google Chrome by providing latest updates. 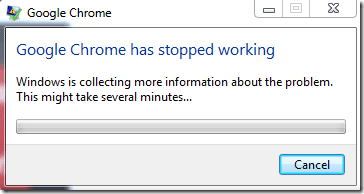 In spite all the efforts of developers sometime Google Chrome faces lots of problems. I have seen many users saying that their Google Chrome showed error something like "Google Chrome Has Stopped Working" and after that they were not able to use it. Daily thousand of users faces this error with Google Chrome. But don't worry I have found all the possible ways to fix or solve this error. There can be many bugs which are not allowing your Google Chrome to work properly. I have covered almost all the errors and ways to fix them. This error occurs when you make some changes in your Google Chrome browser. Those changes can sometime cause errors and then your Google Chrome browser will not work properly or will shutdown accidentally. You can fix this error by following steps given below. Simply navigate to this location C:/Users/Your_Username/AppData/Local/GoogleChrome/User/Data/Default. There you will see a file called "Preferences", just right click on it and delete it. Simply navigate to this location Users/Your_Username/Library/Application Support/Google/Chrome/Default. Simply delete the file "Preferences" from the list. Note:- Here your Your_Username is your computer name or your account name. Sometime there can be any software that is known to cause Google Chrome to crash. You can check for conflict software by typing chrome://conflicts into your Google Chrome address bar. If there will be any software that is causing Google Chrome to crash then it will be highlighted on this page. You will be shown conflict software and ways also to take any action. In most of the faces it's an malware which should be removed with anti-virus software or program. Sometime Google Chrome crashes due to problem in protected system files. So to fix this follow the steps given below. Press Windows Key+ R to open Run. Now enter the following command SFC.EXE /SCANNOW (There should be space between .EXE and /) in the Run. This will enable Microsoft Utility and after that it will scan all the problems in your protected system files and fix it. Click on the top right side corner button (That three line button) in your Google Chrome browser and click on Settings. Now scroll to the end of the page then click on show advanced settings. Now click on Content settings, now there you will see a option All cookies ans site data below the Cookies menu. Click on it and then simply remove all the cookies by pressing remove all button. Type chrome://extensions in your Google Chrome browser. Now disable all the unwanted extensions. Type chrome://apps in your Google Chrome browser. Right click on any unwanted app and remove it. Some by just resetting your Google Chrome to its initial point can solve your problem. At the end of the page you will see a option Reset Settings. Click on it to reset your Google Chrome. Sand box is a tool which is used to secure Google Chrome browser. Sometime you might not be able to see webpage correctly due to sandbox. So now you will need to turn off it. Go to your desktop and right click on Chrome shortcut. Select properties and then go to shortcut tab. Now just add this "-no-sandbox" at the end of path. This might help you to recover your Google Chrome. Inspite all these if your problem is not solved then just try to update your browser or reinstall it. This will surely solve your problem. Sounds good that this article solved your problem. Keep visiting for more crunchy articles..